There are numerous videos devoted to the blockchain and millions of words written to make the concept digestible to the average intellect. I’ve managed to get a fairly clear picture of the possibilities it offers both artists and distributors in the music industry. I can see how it will bring a fair and balanced environment back to the business of making and selling music. The blockchain also known as distributed ledger technology is a list of all transactions in an electronic peer-to-peer network. Every network has a stream of nodes, or data landing stations. There could be hundreds of thousands in a single network. Each node receives a copy of an entire ledger of data. For example, if it’s a song, it is distributed in sync among all the nodes throughout the network creating a blockchain. Every node works with all the other nodes to maintain consistency, and for any changes to take place there must be a consensus among the participants. When a change takes place and is approved through consensus, the data entered is then accepted as valid and inserted in as a new ledger, a “block”. At this point, it becomes a part of the ledger/blockchain. There is no central authority as it is the blockchain itself that acts as the monitor. There is no central server. Digital signatures aka hashes tie the transactions to its source. It’s a system that can’t be hacked because it would require hacking the entire chain rather than just one or two servers. In the music industry artists are suffering when their talents are reduced to pennies on the dollar due to pirating. Because the blockchain/distributed ledger is a decentralized system with servers scattered across the world, it establishes an artists’ equity sharing program automatically. It is transparent in the fact that when information is initiated, it goes to all servers and is time stamped. This makes it easier to create cost-effective business – no matter what the industry, because anything of value – like musical artists’ creations, or products are tracked and traded. It can be used to track music as it moves through the supply chain. If someone purchases a piece of work the entire distributed ledger/blockchain is made aware in nano-seconds. 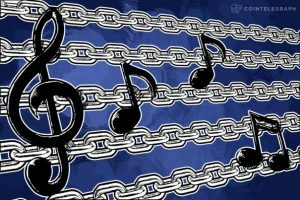 When music is published using the blockchain it is given an individualized ID along with a time stamp. This makes it unique and unalterable therefore it cannot be downloaded, copied and modified for the pirates looking to get it for free. This brings the money back to those who deserve it without diluting the content or profits. The subject of the blockchain also known as distributed ledger is vast. It’s far reaching implications leave us with a more balanced and for that matter, safer world. A composer, artist, producer, marketer or distributor – all the spokes that support the wheel of commerce can be protected. What do you know of the effect the blockchain could have on your industry niche? Leave a comment below and let’s keep this conversation going.